A fungal nail infection is an infection of fungus underneath the nail which can appear discoloured, crumby, thickened or deformed. Our podiatry team will assess your feet, nails and suitability of treatment. Podiatrists can give you an accurate diagnosis of a fungal nail by taking a clipping, culturing the sample and formally reporting the results. After our podiatry team take a sample of your nail, you will be contacted within 5 working days by phone or email to discuss your results. Once reported, your podiatrist will discuss the cause of your nail pathology. It is important to remember that not all nail discolouration or nail deformity is fungus. Psoriatic nails, nail trauma and anaemia are some of many other causes of nail changes, which will be comprehensively examined within your appointment. 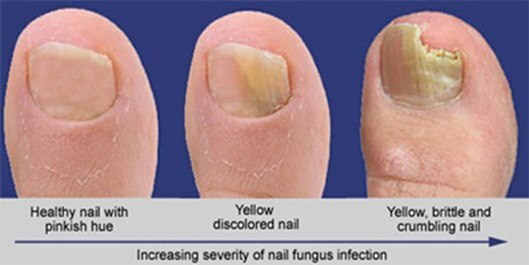 Test the nail for fungus. When you attend for an initial consultation, our Podiatry team will assess your feet, nails and suitability of treatment. The podiatrist can mechanically debride or remove some of the fungal nail infection without the use of local anaesthesia. This is a pain free treatment and needs to be repeated every 2 months until regrowth of the nail is viewed or a change in treatment plan is required. Patients are asked to apply Lamasil spray onto their nails 1-2 times per day during treatment. Drilling holes within the fungal nail infection has been increasingly popular over the last few years. The nail is drilled with a fine 1 mm burr and treatment is repeated every 2 months until regrowth of the nail is viewed or a change in treatment plan is required. Small holes are drilled to penetrate to the nail bed and allow antifungal treatments to be more effective. Lamasil spray is then applied 1-2 times, daily during treatment. This treatment is generally pain free however some discomfort may be felt during drilling. In some instances, local anaesthesia can be used to numb the toe. If the whole nail is affected and becomes painful, our podiatry team can remove the nail and either allow regrowth of the nail or prevent the nail from re-growing.